Two terrorism experts and a professor of Islamic Studies questioned the assertions in Hamid’s chapter of the Air Force white paper, calling them unsubstantiated. 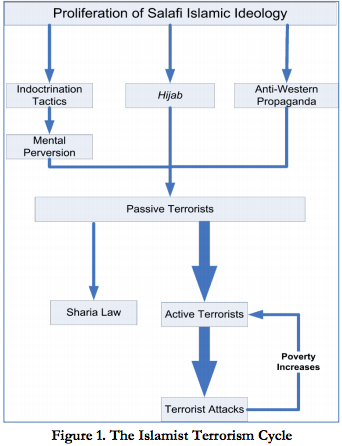 An accompanying chart that describes Hamid’s purported theory of radicalization is similarly unfounded. “One thing that is absolutely clear from studies of radicalization is that this conveyor belt model from ‘conservative beliefs’ to ‘violence’ is incorrect,” Amarasingam says. Ingrid Mattson, a professor of Islamic Studies at the University of Western Ontario, said Hamid’s comments about the hijab are baffling. She pointed out that the garment is worn by an incredibly diverse array of women, including Nobel Peace Prize recipient Malala Yousafzai, who was the subject of a Taliban assassination attempt after she campaigned for women’s rights in northwest Pakistan. Hamid’s article also expresses a striking faith in the power of government public relations efforts to overcome deeply unpopular policies toward the Middle East. Hamid’s theories seem to contradict a Rumsfeld-era study commissioned by the Pentagon’s Defense Science Board Task Force. That study traced the poor reputation of the U.S. in the Middle East to government policies, not to insufficient PR. 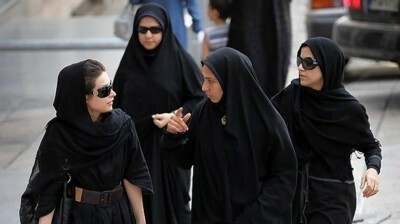 Arguing that “Muslims do not ‘hate our freedom,’ but rather, they hate our policies,” the report cited the U.S.’ support for dictatorial regimes, its military occupations of countries like Iraq and Afghanistan, and its “one-sided support in favor of Israel” as the primary factors behind its poor reputation in Muslim countries. Still, Hamid’s thoughts are apparently influential in government; he says on his website that his opinion has been solicited by a wide range of government agencies, including the Department of Defense, the National Security Agency, the Special Operations Command, and the Office of the Director of National Intelligence. It is not clear if he has been paid for his appearances at such agencies. Hamid is currently a writer at the right-wing website Newsmax, where he publishes a running column titled “Inside Islam.” In recent weeks, he has written several articles lavishly praising Republican presidential candidates Donald Trump and Ben Carson for their vituperative public statements about Muslim Americans. Hamid did not respond to requests for comment. 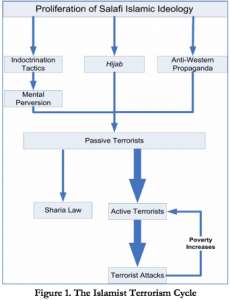 The updated version of Countering Violent Extremism: Scientific Methods & Strategies includes a preface that credits Hamid with providing a “soup to nuts strategic plan” for combating radicalism that “addresses the components of the Islamist terrorism cycle at ideological, psychological, social, and economic levels.” The original version of the report was cited by the FBI in the development of its own anti-extremism strategy in 2014. Both the original and revised versions contain Hamid’s chapter on radicalization. Hamid’s chapter “is no more than Islamophobic propaganda and should not have been included in any kind of government training material or published research,” Kundnani said.